THE CANADIAN PRESS -- An Ontario man has come down with Canada's first suspected case of E. coli linked to the outbreak in Europe. Ontario's Ministry of Health and Long-Term Care says the man is from Peel Region, and he travelled to Germany earlier this spring where he ate local salad products. The outbreak has also spread to the U.S. where four people in Atlanta were apparently sickened by the bacteria while visiting northern Germany last month. Sprouts from northern Germany were ruled out as the cause of the outbreak, as were contaminated cucumbers from Spain last week. Officials are focusing tests on tomatoes, cucumbers and lettuce from the European Union to pinpoint the cause of the outbreak that has sickened thousands and left over 20 people dead. In Canada, some farmers fear the outbreak is already proving bad for business. The organization that represents Ontario's greenhouse vegetable growers says some of its members have reported a drop in sales as demand slips on news the source of the deadly bacteria remains unknown. A spokesman for the Ontario Greenhouse Vegetable Growers said Ontario growers must meet strict food safety requirements and Canadian consumers shouldn't be worried. But in an increasingly globalized food marketplace, the worry remains. Microbiologist Rick Holley, a food science professor at the University of Manitoba, is troubled by problems with the North American and European food contamination and inspection services. "There are some things systematically wrong with the system in North America and in many European countries. One of those things is the issue with respect to ignoring inputs of salmonella and pathogenic E. coli into the agriculture system through contaminated animal feed," Holley said. "And until we figure out a way of doing this effectively, we're going to be faced with seeing reports of food-borne outbreaks caused by produce, specifically caused by one or the other or both of these organisms." While American health officials continue to investigate local cases related to the European outbreak, the U.S. Government has ramped up efforts to test food from Germany and Spain. On Friday, the Canadian Food Inspection Agency said it also would enhance its controls on produce from the European Union. 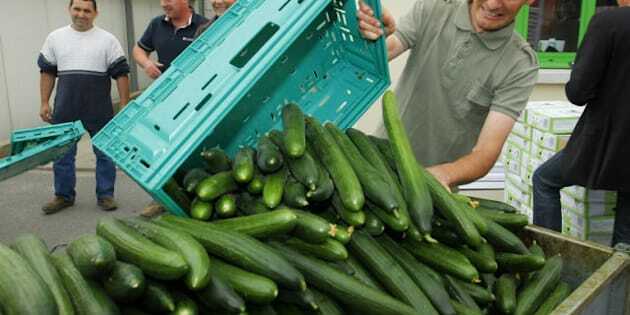 The CFIA said it will intensify sampling and testing of European cucumbers, tomatoes and lettuce. The agency said there is no indication that any contaminated product has been shipped to Canada.